PARKING IS NOT AVAILABLE IN OUR LOT FOR THIS CRUISE. This cruise utilizes both vessels. Departure from Portsmouth is aboard the M/V Thomas Laighton. Departure from Star Island at 2:15pm from the floating dock adjacent to the pier is aboard our smaller vessel the Challenger. Narration of the islands is provided while aboard the vessel. The walking tour of Star Island is self guided with the use of a map containing points of interest and historical information. 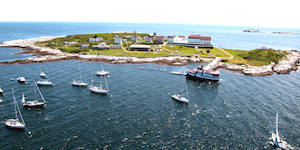 This cruise allows approximately 2 hours on Star Island.